Edgar Christian Salvesen was born in Paris, France, in 1884, son of Henrik Emil, a shipbroker. The Salvesen family originated from Norway, but settled in Scotland in the first half of the nineteenth century and were involved in timber, coal exporting, and shipping. Salvesen was educated in Glasgow, and apprenticed to Chartered Accountancy firm S. Easton Simmers. 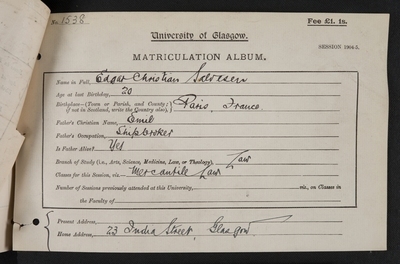 He matriculated at the University of Glasgow in 1904, aged 20, to study Mercantile Law under lecturer William Shaw. In 1907, Salvesen was admitted to The Institute of Accountants and Actuaries in Glasgow (IAAG), and went to Calcutta to work for accountants McKinnon, Mackenzie & Company. In 1909, Salvesen immigrated to the US, where he became the Secretary and Treasurer of the Minnesota Society of Certified Public Accountants (MNSCPA) and a Minnesota Certified Public Accountant in 1910, while working at the Scottish Chartered Accountancy firm of J Gordon Steele & Company. Salvesen also became a member of the Association of Authorised Public Accountants (AAPA), and in 1916, joined the American Insurance Association (AIA). He was employed with companies such as PricewaterhouseCoopers (PWC), and Longacre Engineering & Construction Company in New York. He wrote a paper in the Journal of Accountancy entitled Advertising as an Asset on the Balance Sheet. Salvesen died in New York in 1959.